lf an external audio source is connected to the AUX-lN connection via the jack plug,the audio data are transferred to the headunit via an audio line.The audio source is selected via iDrive．The tracks are selected on the external audio source. Apple iPod devices are connected to the vehicle using the adapter for Apple iPod (Y-adapter 30-pin connector on USB and AUX-IN) available as a parts accessory from the BMW Group.It enables rapid access to the audio files on the iPod and also recharges the iPod. Other MP3 players Or USB sticks are connected to the vehicle via a bidirectional data line.This line is also used to charge the external device(with max.500 mA).To avoid malfunctions,do not connect to the 12 V socket of the vehicle at the same time. To link the MP3 player in the mobile phone,an audio connection for Smartphones is available(optional equipment (SA) 6NF “Extended connectivity of the music player in the mobile phone”). The connection of an MP3 player in the mobile phone is integrated in the vehicle system in such a way that audio playback is still possible via an external audio source (e.g. MP3 player, iPod, USB stick, etc.) but now can also be obtained via the Smartphone contained in the snap-in adapter. This connection of the MP3 player in the mobile phone is necessarily established when using the optional equipment (SA 6FL MUSB audio interface). In combination with both options (SA 6FL and SA 6NF), the vehicle is now equipped with a new AUX-IN connection that has an internal switching function. It switches the audio signal to the interface box; this audio signal either comes from the eject box or, in the second switch position, from an external audio system via the jack plug or Y-cable. 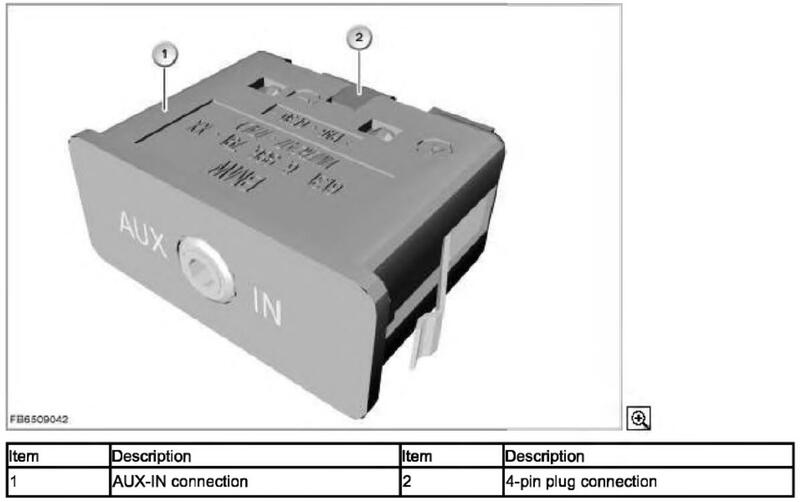 The second switch position is triggered when a jack plug is plugged in. Operation and navigation in the menu of the respective Smartphone is performed via the iDrive menu. Unlike optional equipment SA 6FL “USB audio interface”，an additional adapter is not needed. The required connection to the USB hub and AUX-IN connection is already integrated in the wiring harness. The control electronics are contained in the eject box. An import via the USB interface on the AUX-IN connection with a USB connection is not possible. This USB interface is only intended for playback of external audio sources. To import/export data (data copy or data backup), a USB interface is available in the vehicle glove box. 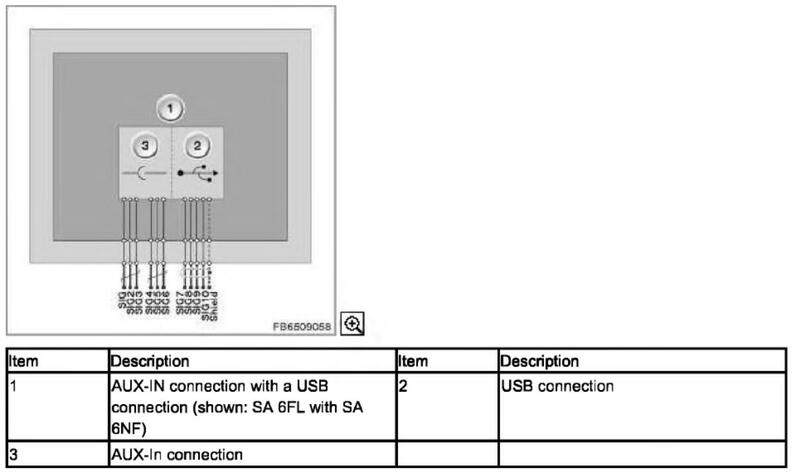 For the AUX-IN connection with a USB connection, the USB connection is connected to the USB hub via a bidirectional data line or directly to the interface box. 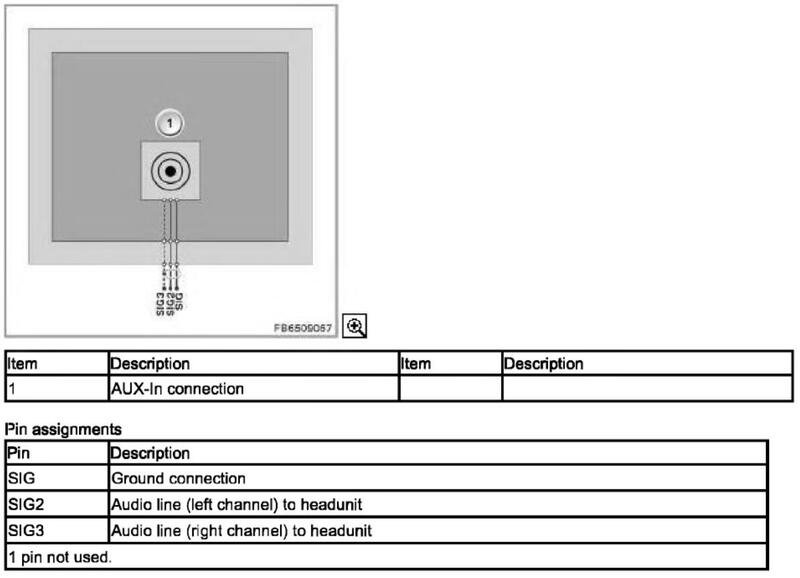 For the AUX-IN connection with a USB connection, the AUX-IN connection is connected to the interface box via a 4-pin plug connection. 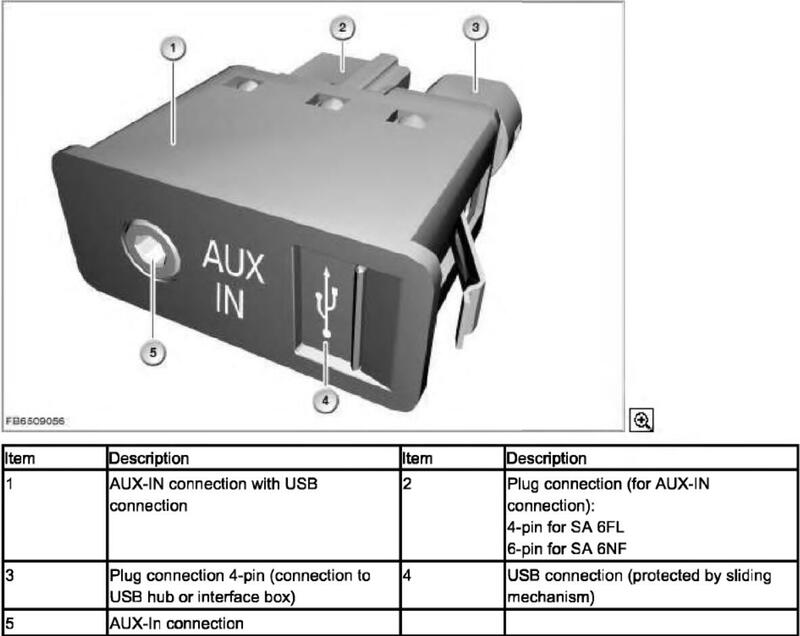 For the AUX-IN connection with a USB connection, the AUX-IN connection is connected to the eject box and interface box via a 6-pin plug connection. The AUX-IN connection or the AUX-IN connection with a USB connection is not capable of self-diagnosis. A functional check of the AUX-IN connection or the AUX-IN connection with a USB connection can be performed using the BMW diagnosis system.